I have a tutorial to share with you, but first I have to share my excitment about our bedroom makeover last year making the Top 12 Makeovers of 2010 list on Better After. How cool is that? Thank you Lindsey! Okay, now a quick tutorial I wanted to share. 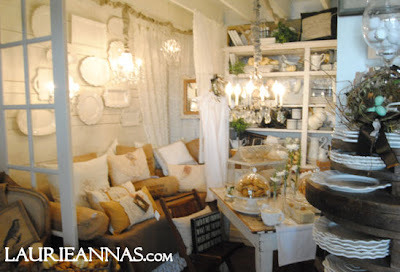 This wall of plates and platters at the Shoppe is a favorite with customers. And, with no evidence of a plate hanger, there's not a sales day that goes by that someone doesn't ask, "How are those platters hanging up there?". That makes me smile, because I wanted the plates to look as if they were floating on the wall rather than seeing the evidence of a metal plate hanger. It's such a simple and clean look that doesn't distract from the beauty of the plates and platters. This is such an easy project, and since so many customers ask about it, I thought I would share how we hung them. 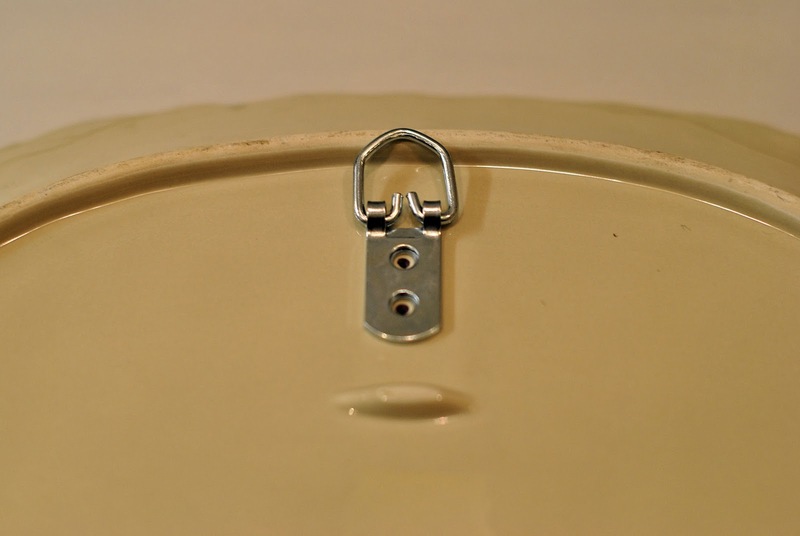 Supplies: All you will need is a tube of epoxy, a d-ring hanger, a marker, and of course your plate or platter. To get started, flip the plate over and determine where you want to affix the d-ring (hanger) on the plate back. Make sure you get it centered. We've found that it works best if the top of the d-ring sits on the top of the plate rim. It also helps if you mark the spot with a marker. The hanger we're using has 2 holes so that it could be attached to the wall or wood. The holes serve no purpose for this project, but are good for marking the spot. Once you've marked the spot, remove the d-ring. Now, with your spot marked you're ready to mix your epoxy. Follow the directions on the package. We use Loctite which is self mixing and squeezes out from a nozzle. 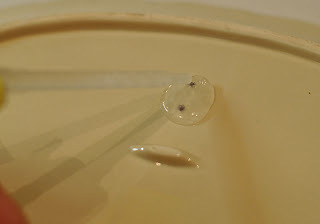 Squeeze the epoxy in a circle (about the size of a quarter) all around the spot where the d-ring will be placed. Next, press the flat back of the d-ring deep into the epoxy until it is firmly against the plate back. Make sure to get the d-ring straight and centered, lining it up to the marks you made so that your plate will hang straight. Let it dry overnight and you're ready to hang your plate. Wear clear project gloves when working with epoxy because it's difficult to remove from skin. 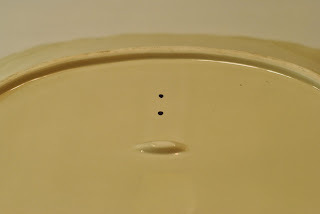 Work quickly after mixing the epoxy as it begins to dry fast. 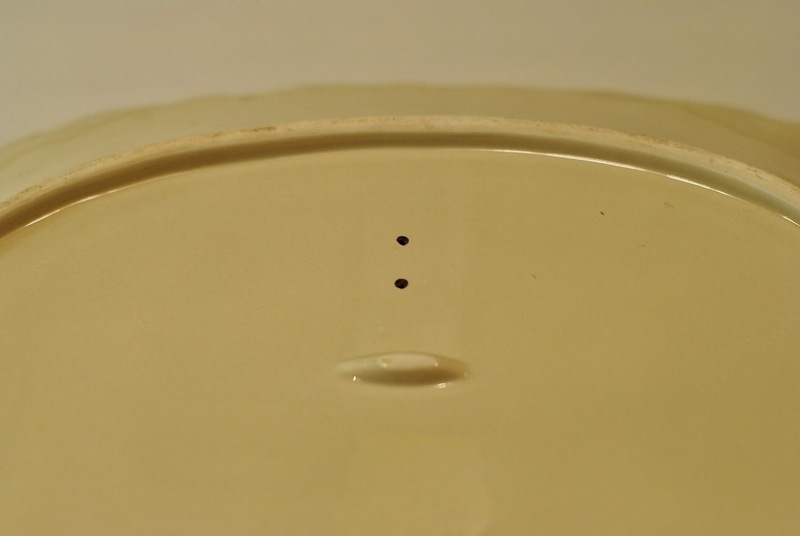 Longer drying time strengthens the adhesion. The only mishap we had was with the first one we hung because we didn't allow it to dry overnight. I wish all projects were as easy as this one. Now, get to hanging those plates! Great tip, thanks for taking the time to share it with us. Congratulations on being featured, it is well deserved. 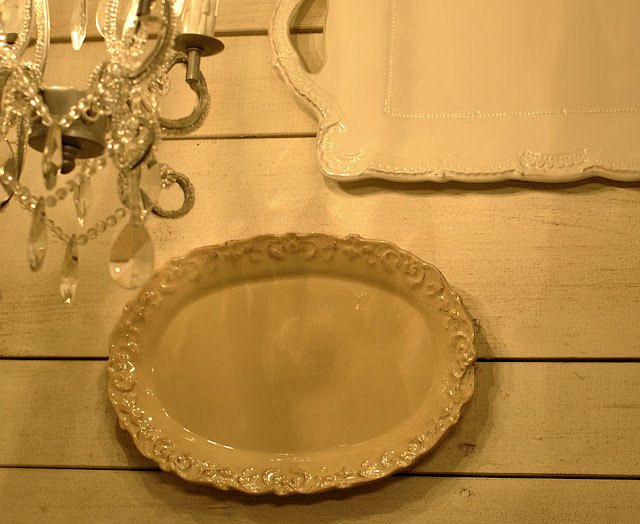 I have some old ironstone plates that I hung in my dining room and I have always hated the metal plate holder. I can't wait to do this, it looks so easy. Wow!!! A feel like a famous person visited me today!!! lol! I just love Lori! Thank you so much for stopping by and commenting! I'm already your follower and just love your blog and everything you do! I do believe I belong on TX! lol! I'm hoping to get back to blogging real soon! My camera has seen better days so I'm searching for a new one right now. Thanks for the how to on the plate hanging. Your room is gorgeous. Well deserved honor. Thank you for the wonderful plate-hanging tip, Laurie!! I will definitely use it! Thanks for the tutorial, I'll have to give that a try! Thanks for the plate hanging tip!! I did wonder how you got them to "float". Ha! Another Darla here, weird. I will be getting rid of my eyesore plate hangers now. Thanks for the tip. Beautiful beedroom. Hi, here from Better After, wonderful tip for hanging plates, love the look and have already made plans to rehang mine, minus the ugly brass holder. Do you have any tips for hanging lids from soup tureens - I have some great ironstone ones, but am stumped as to how to hang them? How have I missed your blog all this time? WHAT A GREAT IDEA FOR HANGING PLATES , THANK YOU FOR SHARING !! I JUST HAVE TO TELL YOU HOW MUCH I ENJOY YOUR BLOG THERE ARE MANY BLOGS I GO TO FOR INSPIRATION AND YOURS IS ON TOP OF THAT LIST !! hang without ugly plate holders !! Congratulations on the feature too ! 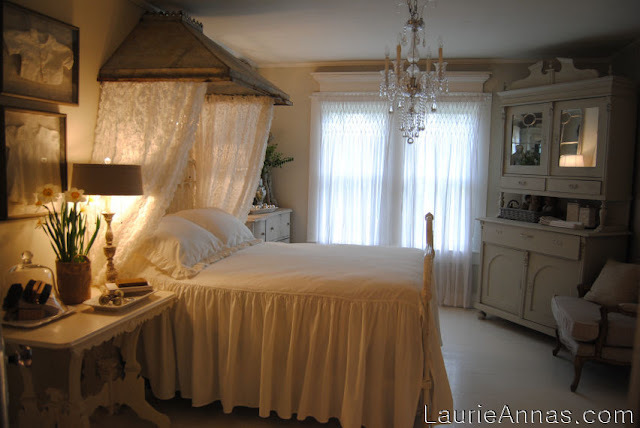 Your room is to die for gorgeous!! Thank you! Thank you! I'm so glad you posted this!! When we were there sat I asked my mom "how do you think those plates are hanging? "......perfect timing!! THanks! 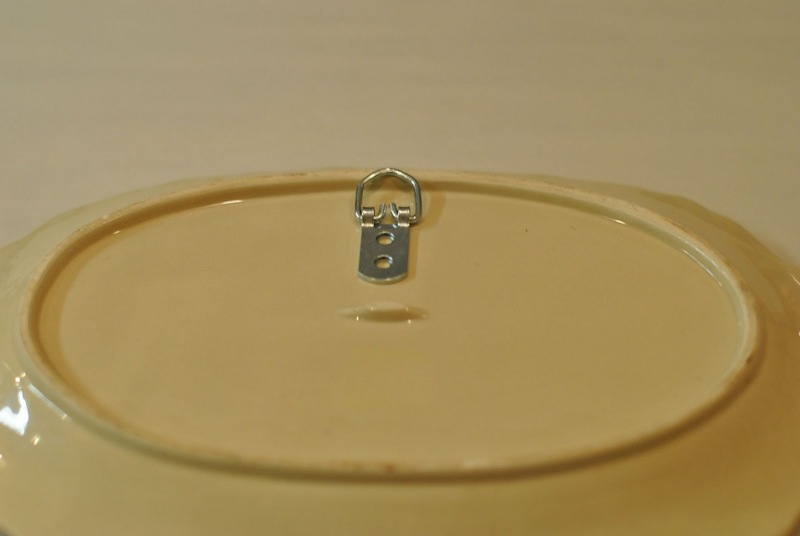 I have been using hot glue and a paper clip on plates in my bedroom, but they keep falling. I will try the epoxy instead. LOVE your bedroom! Very cool tutorial. I also love your site design. I'm giving you the Stylish Blogger Award. Don't feel presured to participate, but you can check it out at Ninth Street Notions and follow me if you get a chance. Love the plate tutorial. I plan to hang some over our bed so this is perfect! This sounds like a great way to save money too! I have about 15 plates that are hanging with the plate hangers and at $2 a piece plus the cost of the plates it adds up fast. Great idea! I haven't used them myself, but they seem to be getting great reviews & may be easier than dealing with the epoxy. You stopped by my blog and left a great comment and I thank you but I am so excited I found you! Another blogger mentioned you (not sure who now) and I curious about your shop because my sister lives in Van and we go to Canton often. I am going to have to try to find you. Do you only have a shop at 1st Monday or all the time? I officially love you! 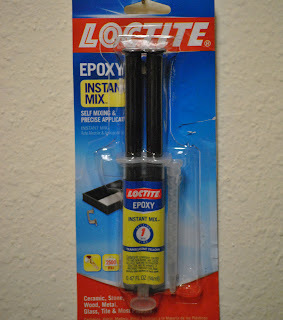 I have this epoxy in my kitchen drawer, now to get the hangars! Oh my you have me so excited to try this. I don't put my plates on the wall because I detest those hangars showing! So VERY happy you posted this.....now off to get those hangars...oh wait it is 1a.m.....guess I will have to wait a few more hours! Thank you for the Amazing tip! Thanks :) Now I can change out all my hangers on my toleware trays!! That is SO cool! Thanks for sharing. I want to start collecting something, and though vintage or interesting plates/platters would be fun. Where to put them though? So maybe dedicate a wall in my kitchen to float them! Thanks for the inspiration!!! That is an excellent idea! I have been meaning to purchase those disk thingys but they are just too much money. Now I know how to hang my plates! Thanx again. Thank you for sharing this, I've always wondered how to hang plates without seeing the hanger. I LOVE,LOVE,LOVE It !!! Do you think I could do the same on my old vintage / ghostly mirrors. They have no backs or hangers on them? I have tried to come up with a way to hang them ... My scare is that the epoxy might do something to the finish on the back of the mirror? That was a great idea you just shared! Thanks a lot. This is really cool. Jumped over from Miss Mustard Seed and I am going to be your newest follower!! Can you tell me if you think this would work for the really HEAVY platters? Love this tip! COme vist me if you have a chance! thanks for posting this! I am changing my home decor into shabby chic/vintage. I wanted to do this without the plate holders showing so this tutorial will be used! Thank you for the work you have put into this post, this helps clear away some questions I had. I would like to hang some platters, but would like to use them, also. Does anyone have a way to this, attractively? Yay! I found invisible plate hangers on amazon but they are 13 bucks for four, yikes. That's more than my thrift store plates cost. Thank you, thank you for your tip. I'm excited to check out the rest of your blog.